Will you be in or around Lynchburg, Virginia on Saturday, December the 6th? If so, please come and visit me at the Lynchburg Arts Market from 10am - 3pm. We'll be between the Starlight Cafe and Folk Boutique on 5th Street in Downtown Lynchburg. Yes, it's an outside venue, so it will be chilly...bring your coat and handmade scarf! I love birds more than sunshine, more than humans, more than anything. And I think I found my obsession/compulsion twin last night, Nikola Tesla. Yes, the famous scientist. I learned that he was so obsessed with pigeons that he had to rescue and save every single bird he saw that he thought was in need of help. I heart you, Nikola! So, that leads me to the main part of this blog post. My husband emailed me a link this morning to a story in our local newspaper. I loved it so much I just had to email the lady that wrote it. I don't normally do those things as I tend to keep to myself, but my excitement was overflowing, and she was kind enough to email back. Thanks, Carrie! Below is the story that I'm sure to read many more times! Simon has never saved a life that I know of, but I am convinced he is smart enough to pull it off. Just a few minutes with the little green Quaker parrot, and you can see the gleam in his tiny brown eye. I’m even more convinced that if put to the test, he would come through after reading a news story about a Quaker in Denver who raised the alarm to save a toddler who was choking. The Quaker, named Willie, began screaming shortly after the babysitter left the 2-year-old girl to go to the bathroom. Willie screamed like never before, then began yelling, "Mama, baby," over and over until the babysitter came out to see what was wrong. By that time, the toddler’s face had turned blue. The babysitter quickly performed the Heimlich maneuver to clear the girl’s airway. So says CBS 4, a local affiliate out of Denver. The girl’s mother is said to credit Willie with saving her daughter’s life. I think Simon could pull off a rescue like Willie. He’s definitely got the smarts. He speaks up when things aren’t quite right, and he’ll scream bloody murder at a stranger that he, or rather I, am not comfortable with. Kashmir Csaky, a local parrot behaviorist, told me that birds are very skilled at picking up on even the subtlest of body signals — those that we may never notice. That explains why Simon goes nuts when certain people are in the house. He sees something change in my body language that I am too clueless to even notice when people who make me uncomfortable are near, and he takes it as a danger signal. Once Simon sees the signal, he’ll tell everyone in earshot that this person doesn’t belong. And he always says it in the most wall-piercing squawks he can muster. Simon feels it’s his duty to protect the flock, and now his burden has increased since we started living with a new roommate. There are plenty of stories similar to Willie’s, including one published in The New York Times in 1903. The story says a bird screamed for help after his owner, a veteran of the Civil War, fell from a stepladder and sliced his throat. The deep wound bled profusely, and the man’s doctor said he likely would have bled to death had the parrot not attracted attention to his owner. Last year in Muncie, Ind., Peanut, the Amazon parrot, began mimicking the smoke detector at the top of his voice when a family’s home was on fire, according to the Associated Press. The father and his 9-year-old son had fallen asleep on the couch and weren’t awakened by the house’s smoke detector. So Peanut took over, waking the two in enough time that they could grab his cage and get out of the house unharmed. There are plenty of birds that have sounded the alarm on a creepy person, a house fire, who have tattled on cheating spouses, won dance competitions or just became the needed companion for a lonely person. Just for fun, and since I'm a bragging bird mom, I thought I'd share some pictures of my little babies! To the left is Blondie the budgie (who is no longer with me, but I miss her dearly) and Frankenstein the budgie whose name matches her attitude. Below is my sidekick and the apple of my eye, Flojo the sun conure, aka Dinosaur Toes. Can you guess how I came up with the name of my blog and Etsy shop?!? I love birds. Period. I watched these two videos on YouTube today and thought I'd share. 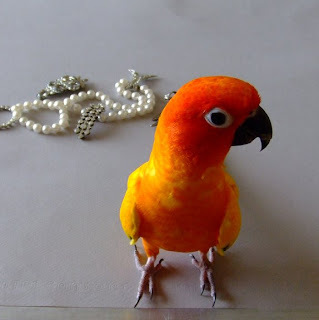 The first is of a sun conure and budgie. I wish my sun conure and budgie got along this well! 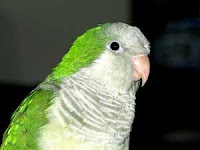 Instead, Frankenstein the budgie will start fights with Flojo the sun conure. A lover and not a fighter, Flojo just fusses and walks away. This video is hilarious! I love caiques, it looks like they're wearing little bloomers! My dad bought me a set of stamps last year, or maybe early this year, I can't really remember! Anyway, I don't use them as often as I'd like becasue there are only so many stamped charms and things a girl can wear in a lifetime! 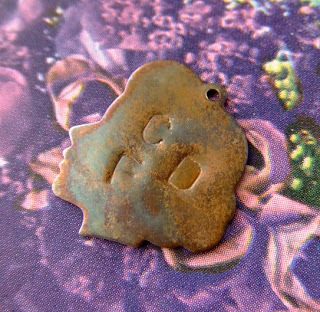 I also have a bag of about one hundred vintage brass girl silhouette charms. I've used some of the silhouettes in jewelry I've made, some I've sold, but I don't know when I'll use that many...so the wheels started turning. Stamping set + plain brass charms = stamped silhouettes! Yipee, a good use for both! I think I'm going to add the charms to my shop tonight. I stamped a C, a D and an F on mine. C for Chris and Cheesecake the dog, D for me (Danielle) and an F for Flojo and Frankenstein the parrots. On a more delicious note, I have meatballs cooking right now and I cannot WAAAIIIIIIIT until dinner time! That's the only problem with slow cooking something, it smells your house up (in a good way) so all you can think about is eating! It never fails, every time I go to the treasury to browse, I see that spots are minutes away from expiring, so I figure it doesn't hurt for me to hang around and make a treasury of my very own! This time, I decided that I would venture out of my rhinestone encrusted comfort zone and go for a look of simplicity. Who am I kidding? I'm not a simple person, and I don't have a simple style. Behold, a treasury worthy of sparkling floral beauties! 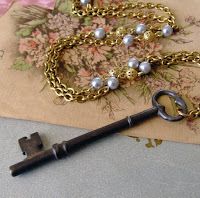 Aqua and Brass - Romantic Vintage Key Pendant and vintage chain by OriginalsByLynnette for $15, Strands of Pearls Bracelet by byCJ for $36, antique button bottle bouquet by Morganevans for $22, Falling roses by thumble for $16, well I am so sweet - vintage evening purse by rubyolivedesign for $35, vintage inspired hand crocheted flower brooch by bohkay for $10, Cafe Latte - Neckwarmer/Capelet by NandaHandcrafted for $62, Butter Yellow enamel hairpins by roseluv for $9.95, Almira brooch by vintagebroochco for $44, Purple for Fall Clutch Frame Purse by sewlola for $75, Lace Flower Pin by dreamalittledream for $20.60, three/way by rhettizms for $15. 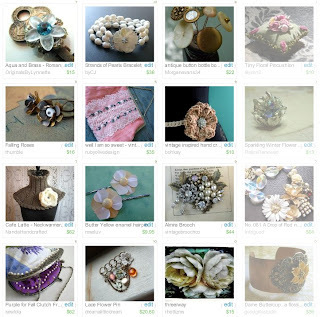 Tiny Floral Pincushion by alyson2 for $10, Sparkling Winter Flower - A Relic Renewed by RelicsRenewed for $13, No. 081 A Drop of Red necklace by intrigued for $68, Dame buttercup a floral cuff bracelet by goodgirlsstudio for $36.